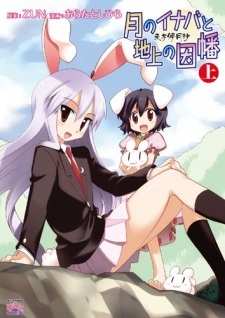 A cute and funny set of stories about two youkai rabbit girls, Reisen Udongein Inaba, Tewi Inaba, and an Exiled Lunar Princess, Kaguya Houraisan along with Reisen's Master, Erin Yagokoto, and their everyday life in Eientei. An enjoyable read for touhou fans but strange enough to get fans into the touhou universe. Comedy is enjoyable societal adventures. No real story Just a Rabbit from the moon who has wa-wa moments. 4-Koma fans are just in for these newspaper comic style of olden days.